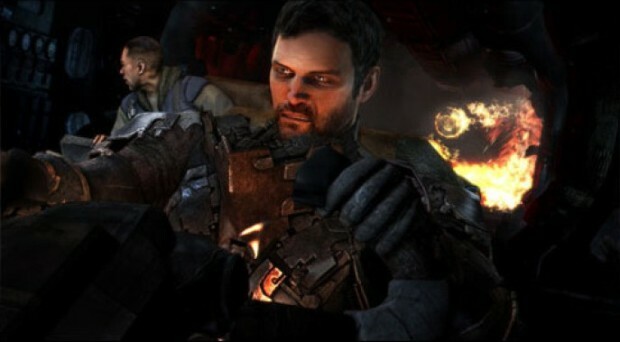 GC: The original Dead Space was pretty scary. Do you think the addition of co-op will make the series less scary? JC: We thought about that and there's nothing we can do to stop two friends playing the game, chatting in their headsets, joking around and saying things like "Oh, my God I bet you're going to get scared coming up" - we can't control that but we can control what happens on screen so we thought about that problem and developed a system called asymmetrical dementia. What this means is that over the course of the game - and it doesn't happen very often - player one or player two will start to experience reality slightly differently. It becomes more warped and twisted the closer you get to your ultimate goal. But because you can't see the each other's screen the fact that you're seeing entirely different things isn't apparent until things start to get out of control. At that point we hope that people will compare notes and be like "Ah, I hear someone on the other side of that door yelling for help. Let's go and help them," and the other player might say "Ah, firstly, I don't hear anybody and secondly, I don't see a door there" - that's not a real example, just a hypothetical one - but when you realise the two of you can experience things in different ways, you don't know whether you can trust the person you've been playing with this whole time and it creates a real sense of tension in both players' imagination that is something we're pretty proud of.